Every lawn care business is different and even the relationship a business has with each customer can vary from one to another. 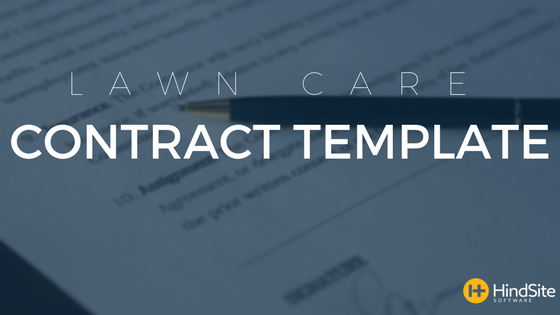 And because of that, below you’ll find both a basic lawn care template and an advanced lawn care contract template. How to Write a Lawn Maintenance Contract. We all appreciate little life hacks that make our lives easier. Things like drive-thrus so we don’t have to get out of the car, online banking so we can transfer money with the tap of a few buttons, and maps on our smartphone to eliminate the dreaded folding of the road maps. The point is, having things more “automatic” makes running our lives a lot easier. This is also true in a business sense. When things are electronic and data is sent in “real time”, our jobs become a lot simpler and more stress-free. Once the customer signs the dotted line, you want to get them on the schedule quick so you don’t let the information slip through the cracks. Scheduling software is perfect for this because it helps you schedule an entire contract at once. You simply state the services that need to be done, select how far apart they need to be performed, and hit schedule. The great thing about contracts, is that most are pretty flexible. If it happens to rain on the day one service is supposed to be completed, you can simply reschedule it for the next day or week and the remaining services for that contract will be pushed forward as well. This eliminates any services being “lost” or not getting rescheduled due to rain or a sick employee. Another awesome feature to help you manage the contracts, is routing. Routing can be done to have the most efficient path for your trucks to follow. You can have them start from the farthest point and work their way back to eliminate driving all over town and wasting gas. Again the flexibility of contracts comes into play when routing for a day or a week. You can check to see if any jobs are in the same area as a contracted customer and simply add the service to the techs day. If they are in the area and the contracted work can be done at any time, why not add it in when your tech is already in their area so that a second special trip does not need to be made? Do you have a lot of information being brought to you each and every day? Is it hard to keep track of every detail that goes along with each customer? Contact information and history may just be your sanity keeper. With the customer’s complete history, you and your techs can see what was last done at the customer’s property. This way you know if they are in need of mowing, blowing, trimming, etc. It helps to eliminate anyone doing the same work twice and gives you one more place to check to ensure the customer’s contract is being fulfilled. With the contract management feature many lawn care software solutions have today, you can see how many more jobs are needed for the customer and if you are going to complete your end of the deal on the contract. It is always nice to have a place to check in and see where your business stands. Having contract management allows you to eliminate any paper shuffling or technician calling and simply pull up the contract in your software and look. You can see how many and which services are still needed and also use it as a selling point. You will be able to offer additional services the customer is not taking advantage of by seeing what they typically purchase from you. Life hacks are the simple things that make our lives a little easier. Make your business life a little easier by managing your contracts with your lawn care software. You already have the software installed, and so using it to its full potential is one more way you can help your business grow, without causing your stress to grow with it.